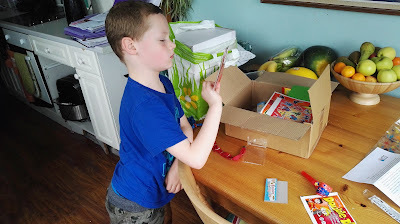 The Blog of Thog: Little Party Parcels Unboxing! 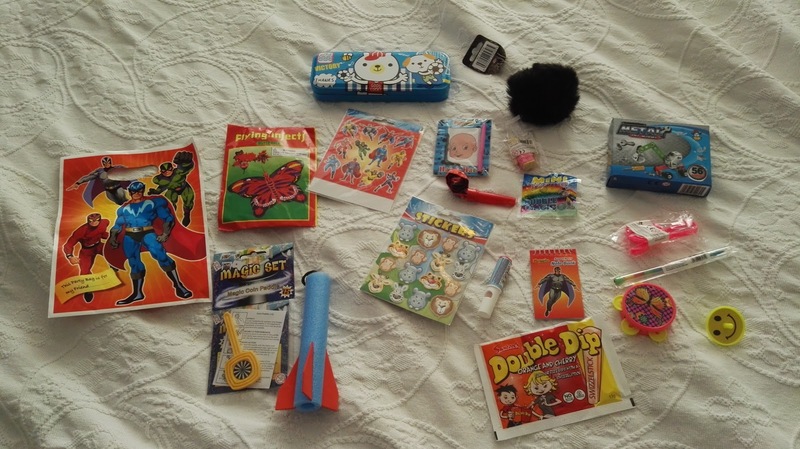 Please note that I received a box of sample kids party bags and party bag items from littlepartyparcels.co.uk free of charge in return for producing this blog post and the linked-to vlog. However, opinions are my own. At the weekend I got an unexpected parcel in the post, which is always nice - it turned out to be that it was from Little Party Parcels, a UK company that sells party bags, goodies for party bags, and pre-filled party bags, with a wide variety of items and bags to choose from. A tiny selection of the items we were sent - my son has taken ownership of most of them, and keeps coming back to help himself to a new toy out of the box! The selection that they offer is absolutely huge and suits pretty much any budget - my wife was particularly taken with a double layer pencil case which was 90p, while I had great fun with a 35p superhero mask, and bag fillers start from just 4p! They don't just do kids parties, they also have a whole section of the website devoted to weddings and entertainments for kids there, which of course is always tricky - as wonderful as weddings are, little ones often get a bit bored! My son picking through the parcel for his next toy! Furthermore, Little Party Parcels are offering a special discount for blog readers - in the cart / view basket area of the website, if you enter the code BLOGTHOG10 in the coupon code field you'll get 10% discount on the shopping cart total! I took the opportunity to ask Jennifer from Little Party Parcels why she started the business, and she said "I was a really boring accountant beforehand, worked long hours, thought that was what you were supposed to do. Had my daughter and knew I could never do the hours or the job again, fell in love with her and fell out of love with my job and accountancy. I did a few local small accounts for a little while but my heart wasn't in it and then after wasting money again buying packs of party goodies in all different quantities thought I would give it a go at only selling what you need (I am very careful with money and hate wasting it). It will never earn a fortune but I do get to the school gate on time most days. I have a couple of friends who are mothers and a grandma (plus my mother if I am really, really desperate), we all pull together and we somehow manage to send out most orders on the working day they arrive or the next working day." Finally, I strongly recommend checking out our unboxing video - we had an awesome time playing with all the toys!! I want to come play at your house! Haha, we do have a lot of fun here!